Deltec Shunts has been acquired by Riedon Inc! We welcome all Deltec’s customers and distributors to the Riedon family. Since 1960, Riedon has been the premier manufacturer of precision and power resistors and serves a wide range of industries. Please visit our website to learn more about our resistor product line! Serving industry since 1986, we pledge a commitment to excellence based upon a philosophy of integrity, knowledge, leadership, teamwork and personalized service. Deltec Shunts understands the needs of business and stocks a large inventory of standard current shunts and fuse products for immediate delivery. 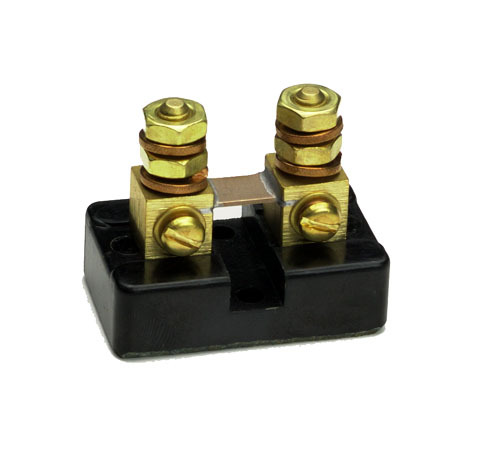 Most DeltecAmmeter Shunts are available in either 50 or 100 millivolts. The terminal blocks on the ammeter shunts are made of high quality brass to allow proper heat dissipation and provide strong support for the entire shunt. The resistance blades are made from manganin shunt metal for its low temperature co-efficient, long-term stability and strength. The manganin strips are soldered into slots in the brass terminal blocks with high quality solder to provide a strong, lasting bond. Where mounting bases are provided, high strength phenolic is used with mounting holes designed in for ease of use. For continuous operation, it is recommended that shunts are not used at more than 2/3 of the rated current under normal operation conditions. Shunts should be located in an area where freely circulating air is available. If this is not possible adequate forced ventilation should be provided to keep the shunt operating temperature at -40° to +60°C. Shunt temperature must be maintained under 145° C or a permanent change in resistance will occur. The Deltec DC Ammeter shunt is designed to provide the highest quality performance possible while maintaining their rugged construction characteristics. All Deltec Shunts current shunts are designed and calibrated at the factory to have standard accuracy of ± 1/4%. The MK series of electric current shunts are manufactured to meet the stringent requirements of GSA federal CID-A-A-55524 specifications. This CID supersedes MILS161B. All Deltec Ammeter Shunts are warranted against defects in materials and workmanship for a period of 1 year. 8:00 AM to 5:00 PM Pacific Time. Tolerances ± .015 for hole diameters. Other tolerances ± .030 unless otherwise noted.